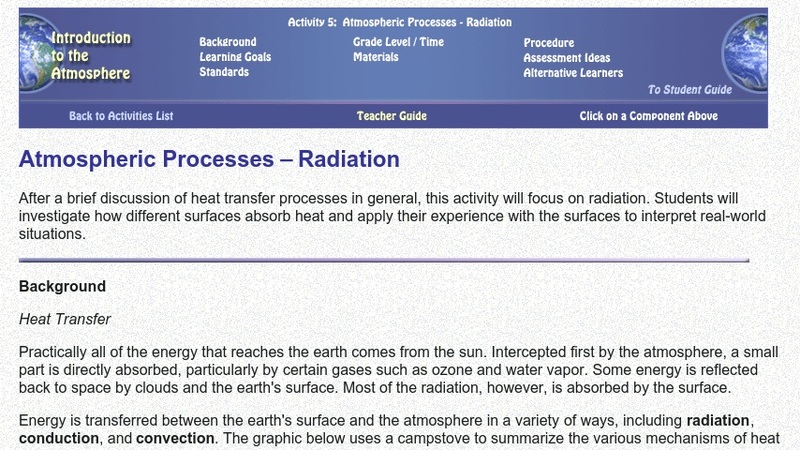 In this activity, students investigate how different surfaces absorb heat and apply their experience with the surfaces to interpret real-world situations. From this information, they come to understand that the physical characteristics of a surface have a powerful effect on the way that surface absorbs and releases heat from the sun and that radiation of heat occurs without the involvement of a physical object. The student guide provides an overall description of the activity, a list of materials, the procedure, and observations and questions. The instructor guide contains detailed background material, learning goals, alignment to national standards, grade level/time, details on materials and preparation, procedure, assessment ideas, and modifications for alternative learners.